What can be done to fix Jakarta's traffic chaos? What can Thailand learn from Switzerland's Mittelland region? Why isn't Hanoi building a subway system? Are high-rise buildings the answer? City planner Kees Christiaanse on metropolises and landscapes in Southeast Asia. Mr. Christiaanse, you have lived and worked all over the world – which place do you like best? Kees Christiaanse: To be honest, it's hard to top Zurich's sixth district. You mean Zurich beats cities like New York and Singapore? It's a ten-minute walk to the woods or the train station. It takes 20 minutes by train to get to one of the world's best airports and only an hour to reach the mountains. There's a lake, a wide range of cultural activities, and both public and private transportation function well. It's no wonder that Zurich always does so well in international quality-of-life rankings. This is the century of the city. According to UN figures, 54 percent of the world's population now lives in urban areas, and that share will increase to 66 percent by 2050. Will all of our grandchildren be living in megacities? No, that's not going to happen. If you look at a world map of population density, you'll see that it's a myth that over 50 percent of the world's population lives in cities, despite what politicians say. Large metropolitan areas are most densely populated. I'd estimate that about 25 percent of people actually live in cities. Another 25 percent live in urbanized areas, so-called desakota regions. Where does that term come from? It's an Indonesian word for a densely populated patchwork of cities, villages and undeveloped landscape, where agricultural activity and industrial production exist side by side. Such regions exist in Java and Vietnam's Mekong Delta, but also in Europe – in Italy's Veneto, Germany's Ruhr region and, to some extent, in Switzerland's Mittelland. Why are these areas relevant? Take a look at Thailand, one of the world's largest producers of rice. It's interesting to note that half of Thailand's rice is produced in the greater Bangkok region – in other words, in an urban area. These areas are doubly productive. You also see this on a smaller scale in Switzerland's Mittelland region, which is not only home to nearly half of the country's population, but also where most of Switzerland's agricultural production takes place. It's a matter of coexistence. Productive landscapes have emerged that combine industry, agriculture and residential use. Whether we like it or not, this is another, inevitable model of urbanization of the future, which will take its place alongside dense cities. So we need to be thinking about it. Why are large cities booming? First, because of the population explosion. In the growing societies of Asia, Africa and South America, people are moving to the cities because there is no infrastructure, job or future for them in rural areas. In Western countries, where the population is stable or shrinking slightly, people are moving to the cities for training and jobs, but also because of the cultural and social opportunities cities have to offer. So villages and small towns are losing population to the large cities. In the digital age, direct proximity is essential. Where you live is no longer as important as it used to be – you can always use email, the telephone or video conferencing to communicate with other people. Will digitalization put a halt to the urbanization boom? No. Thankfully, that is not going to happen. On the contrary, the “new economy” has triggered an urban renaissance. In the digital age, we are learning that direct, physical proximity and touch are an essential part of human life. Physical mobility is increasing; train, car and air traffic are continuing to experience exponential growth. In the business world, too, job-related travel has increased, despite the option of video conferencing. It is important for people to share meals and participate in on-site crisis meetings lasting long into the night. It has been shown that when people with very different perspectives come together in one place, it leads to innovation and economic development. As cities grow larger, they need to become denser. Are high-rise buildings the ideal solution? In places like New York, Tokyo and Hong Kong where large numbers of people live and work in a limited amount of space, there are good arguments in favor of high-rise buildings. In Europe, such buildings tend to serve as a symbol or landmark, rather than as a necessary means of increasing population density. It is a myth that Europe needs high-rise buildings because so many people are living here. Compact four or five-story buildings such as in London or Wilhelminian-style buildings in Charlottenburg in Berlin can house a large number of people in a relatively small space. Yet European cities like Milan, London and even Zurich are experiencing an unprecedented boom in the construction of high-rise buildings. This makes sense for large European cities with extensive networks as centers of finance, culture and knowledge, where land is expensive. These cities are going to attract people, and those people will find high-rise buildings appealing. In London, many high-rises are being built because property prices have soared a result of favorable tax rates for foreigners. When is a high-rise building best suited to office use, and when to residential use? Apart from the very best locations, it doesn't pay for a high-rise office building to have an area of less than about 1,000 square meters per floor, and such buildings are massive and lack grace. The Prime Tower in Zurich found an elegant solution to this problem; despite its size, it doesn't seem ungainly. Narrow high-rise buildings are better suited to residential use, or perhaps as hotels. An interesting trend is the so-called permanent stay hotel. Many such residential hotels already exist in Hamburg, New York and Amsterdam. Companies or universities rent apartments for temporary use by their employees or guest lecturers. Switzerland – A model of urbanization for the future: Nearly half of Switzerland's population lives in the Mittelland region. This is also where most of the country's agricultural production takes place. Jakarta – Pure chaos: Aside from motorcycle taxis and minibuses, Indonesia’s capital city has practically no public transportation. The government lacks the ability to push through major infrastructure projects. Are high-rise buildings also a way of dealing with demographic change? Are they a good option for seniors? Yes, certainly. A retirement home with dining facilities and other amenities on the ground floor is an excellent model for an urban high-rise building. Today a variety of “menu” options are available to customize the level of care, between fully independent living, on one end, and round-the-clock care on the other. As people age, they can pay for additional levels of care as needed. Some of our buildings have an atrium with a hair salon, a swimming pool, restaurants and retail outlets. Since these facilities are also open to nonresidents, they help to revitalize the surrounding neighborhoods. You are the director of the Singapore-based Future Cities Laboratory, which was established by the Swiss Federal Institute of Technology Zurich to conduct research on urbanization. What, specifically, is your mission? Singapore has undergone incredibly swift changes, transforming itself from a port city into a center of industrial production, then into a high-tech city and now a financial center. Today, its strategy is designed to make Singapore one of Asia's most important knowledge hubs and allow it to catch up with cities like Tokyo. Our original mission was to work on optimizing Singapore's urban development and infrastructural conditions. But we were able to convince our clients that it was necessary to expand our focus to a larger region in Southeast Asia, including Malaysia, Indonesia, Thailand and South China. Southeast Asia – not including South China – is home to far more than half a billion people. And it is here, in an area that accounts for only a relatively small part of the Earth's surface, that the most intensive and rapid process of urbanization the world has ever seen is taking place. This creates enormous challenges. These countries differ dramatically in their development – with regard to infrastructure, prosperity, environmental quality and quality of life – and in their building stock. Through our research, we seek to identify the changes that are taking place and offer governments and their partners design guidelines and recommendations for action. Because of growth, traffic in some of these cities threatens to break down completely. Yes. In Jakarta, for example, the chaos is truly overwhelming, even worse than in São Paulo or Lagos. Aside from motorcycle taxis and minibuses, there is no public transportation – while the number of private vehicles continues to grow. But the government lacks the ability to push through major infrastructure projects like the metro in Shenzhen or the elevated rail network in Bangkok, which have utterly transformed those cities. What can an urban planner do in such situations? Three years ago, a Bus Rapid Transit system (BRT) was introduced to address the most urgent problems. This system was invented in the Brazilian city of Curitiba in 1974 by architect and governor Jaime Lerner. Bus lanes are created that are physically separated from other traffic, with express buses departing every three minutes and at intervals of 300 meters. Jakarta has created bus lanes that cross the city. This is a first step, and it has eased the situation somewhat. Unfortunately, however, cars and taxis use these lanes illegally, causing considerable disruption to the system. For a city like Jakarta, the only real solution is to put in place an extensive network of subways or elevated railways. What effect is air traffic having on urban development? In Southeast Asia, planes have the function trains did in 20th-century Europe. Yesterday's train station is today's airport. Most airports in Europe are located no more than 15 kilometers from the heart of the city. To give you one example: I landed in Zurich yesterday at 6:05a.m., and by 6:37, I was taking a shower at home. Our airports have become centers of urban life. They are located on important transport routes and linked to the Intercity rail network. At Zurich's Kloten airport, you will find just as many commuters as airline passengers. In Asia, the airports are out in the countryside, far removed from the cities. They often lack good rail connections and are not part of urban life. Their main purpose is air travel, and their surroundings are very different. However, since planes have become the main means of transportation between the large cities – since there is a lack of infrastructure for other options, and because of geographical barriers like water – the airports will, in the future, have to become urban centers as well. Is the type of government an important factor in how quickly and effectively urbanization-related problems are solved? Governments that have a great deal of power, like China's, have an easier time putting their agenda into practice. The subway systems in Beijing and Shanghai were built in record time, for example. Singapore, with its highly developed organizational structure and centralized government, is also in a powerful position when it comes to urban planning. The results can sometimes be unfortunate, as when residential neighborhoods are relocated or large-scale construction projects reduce the level of diversity. Asia's "turbo-urbanization" has resulted not only in an increase in traffic, but also in another major problem: worsening pollution. What measures might address this issue most effectively? A reduction in harmful emissions, a sustainable approach to the disposal of waste and sewage, appropriate water management and a functioning public transport system. Can we Europeans learn anything from the urbanization taking place in Asia? 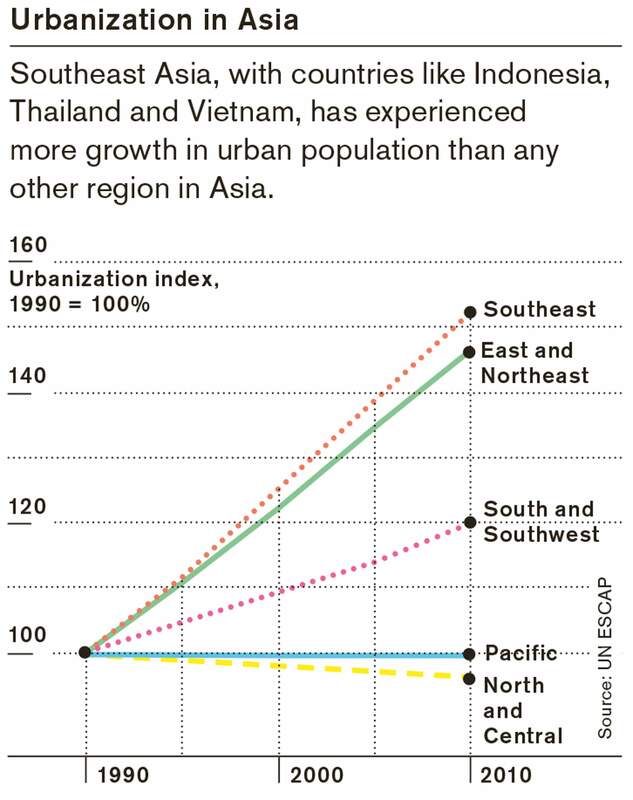 Actually, I think a look at Asia makes it clear just how successful our model of urbanization has been. Western Europe has approximately 600 cities with a population of between 50,000 and 100,000, plus a few cities with more than a million people. We still have an acceptable mix of populated and unpopulated areas. And our cities are well connected by a high-quality network of highways, railroads and air traffic. Zurich's Europaallee, the HafenCity project in Hamburg, 600 apartments in Rotterdam, the new Eindhoven airport, as well as projects in Asia: Are there still more architectural or urban-planning challenges you'd like to tackle? We have designed and implemented many master plans, and have built many office buildings and residential units, as well as a few schools. But we've never completed a major public building. The airport in Eindhoven was an interesting project, but rather modest in size – it was intended to accommodate six or seven million airline passengers per year. I would love to design a large, sustainable, international airport to serve as a model for an urban center. Kees Christiaanse, 62, has been a full professor of architecture and urban design at the Institute for Urban Design, Swiss Federal Institute of Technology Zurich, since 2003. He is head of the research group for contemporary design strategies and director of the Future Cities Laboratory in Singapore, overseeing a staff of 75. 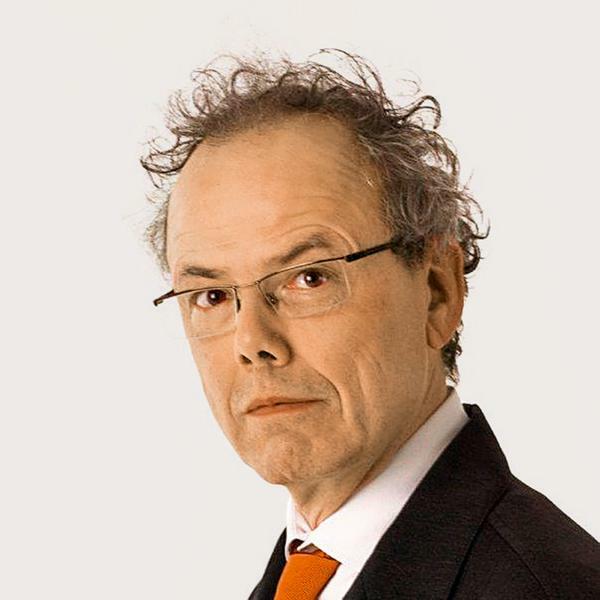 Originally from the Netherlands, Christiaanse is also founder and partner of Kees Christiaanse Architects&Planners (KCAP), which has offices in Rotterdam, Zurich and Shanghai. Christiaanse lives with his wife and three children in a five-room house in Zurich.